ey you guys, this video review will help you get prepared to have fun and what’s more important, capture all that fun. 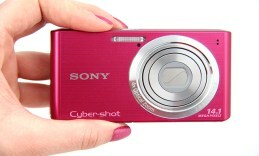 This is the handy pocket digital camera Sony Cybershot W610. This 14.1 megapixel buddy will be with you everywhere – ready and waiting to capture and save the best moments from your holiday, a trip abroad or a fun hang-out with friends at the coffee house. The lens type is Sony and has a wide-angle lens that covers the focal length of 26mm to 105mm. The sweep panorama mode expands the angle even further. As a result this Sony point-and-shoot camera creates panoramas up to 360 degrees stitching perfectly multiple shots. Just press and sweep the camera along the scene to make an impressive wide-angle landscape. The image sensor on board is 1/2.3’’ Super HAD CCD one which delivers an accurate digital interpretation of the colors and the contrast. The resolution of the output images is 4302×2432. Thus with attention to every detail the Sony Cybershot W610 produces high-resolution prints up to A3+ format. This camera orientates and recognizes the scenes for you. Intelligent Auto mode is a much advanced shooting mode in comparison to common auto mode. Intelligent scene recognition measures light conditions, objects, colors and automatically adjusts camera settings to take perfect photos. Backlight, backlight portrait, twilight, portrait, landscape and macro are the modes the camera chooses between. When taking photos from a distance you are facilitated by a 4x optical zoom. The 2.7 inch Clear Photo LCD display allows you to easily preview the photos you have taken even in direct sunlight. The ISO sensitivity of this handy camera is up to 3200. The LED flash provides even light and unlike most flashes doesn’t overexpose the portraits. Face detection technology makes it easy for you to focus and snap, especially if you take a self-portrait. The red-eye reduction function helps you avoid that annoying effect. The ISO sensitivity of this handy camera is up to 3200. The Sony Cybershot W610 handles dramatic contrast just fine thanks to the Dynamic Range Optimizer that manages the levels of shadows and highlights to achieve the best balance for well-exposed images. It is a quite handy feature as it delivers more natural-looking images especially with portraits. This point-and-shoot camera captures video in VGA format at 640×480 resolution and mono sound. The interface of the camera offers a memory card slot and a multi AV/USB 2 port to easily share and transfer your photos. The battery unit is a Li-Ion 630mAh one.